The fourth and final silver coin from the Royal Australian Mint’s International Polar Year series has been struck and given its name, the Aurora Australis. 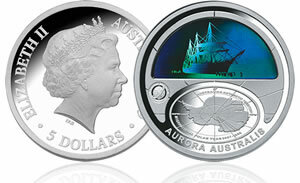 The $5 silver proof commemorative is unique in the series with its dynamic hologram design that portrays the mesmerizing and colourful Aurora Australis surrounding a sailing ship. "In an exciting finale to our International Polar Year coin series we have released a fourth coin which captures the amazing colours of the Aurora Australis. This coin also includes, in hologram form, design elements from the preceding coins in the series; a map of key scientific base camps, the Antarctic Skua in flight and the first Australians to reach the South Magnetic Pole." The Aurora Australis, also referred to as the southern polar lights, are produced by charged Sun particles (the solar wind) colliding within the Earth’s magnetic field. 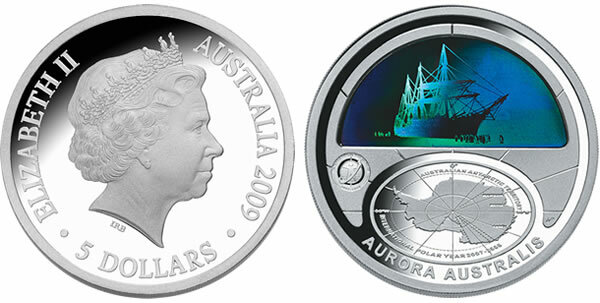 The 2009 Aurora Australis silver coin is struck from 99.9% pure silver, has a mass of 1 1/7 troy ounces, a diameter of 38.74 mm and is limited to a mintage of 12,500. The Mint indicates the coin will not begin shipping until March. Please advise where and when I will be able to purchase or order the Australis Coin.